In June, 2014, I have just completed the 9-weeks-long Course class “The Science of the Solar System” with the world known professor Mike Brown – the person who declassified Pluto as a planet. I have been very very busy with many things lately! You have probably seen that for the last several weeks, there have been fewer posts in the site, but this is not due to laziness or lack of interest (I doubt that will ever happen). It was because (almost) all of my free time went studying for the Caltech (California Institute of Technology) class “The Science of the Solar System” with Prof. Mike Brown. I have been dreaming to go study in Caltech for a long time. I will take steps towards that dream for sure, but this 9-week class was kind of a “preview” for me of what can I expect if I am a Caltech student.. and I have to tell you that I like it a lot! World class quality scientific information, hard exams, tons of information, quality lessons and so much more make this class an enormous pleasure to attend to. I spent 20+ hours per week studying on this class, I even had to study while on an airplane trip from Madrid to Sofia, while my friends were dancing on 30 thousand feet height and I enjoyed every single bit of it – I got 100% grade in the class! I will write articles on the class’s material, so stay tuned for a wealth of information! 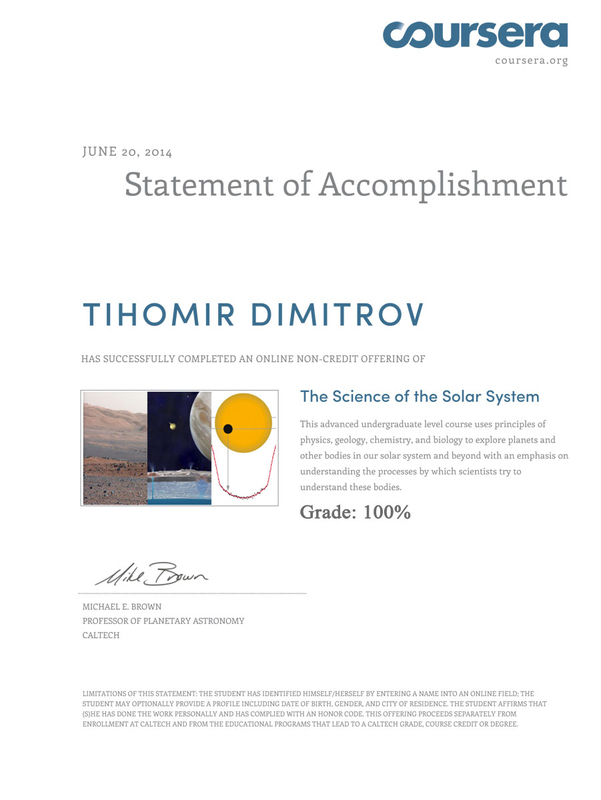 SciSolSys Certifiate Tihomir Dimitrov I have added the grade to the certificate. It was originally not written on it, but it is the actual grade that I have and I wanted it to be shown. 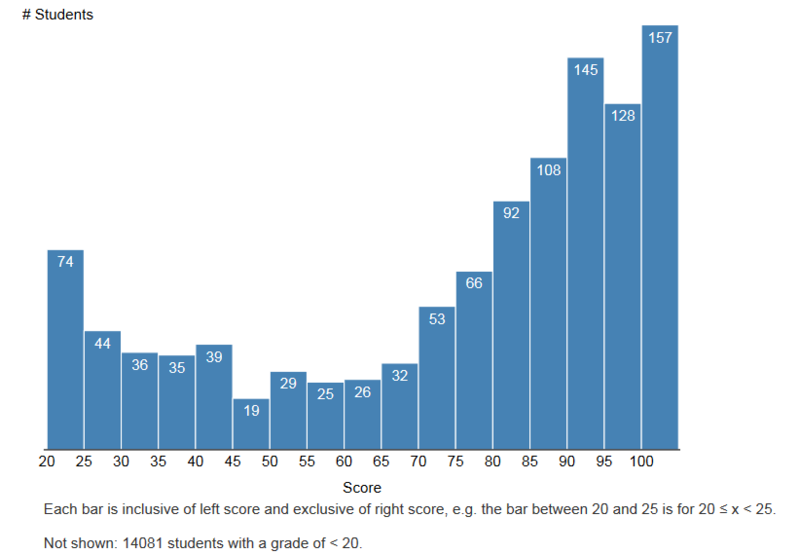 There were more than 15000 people enrolled in the class in the beginning, out of which only 750 students received certificates (one needs a grade above 70% to receive a certificate) and only 157 people got a grade 100%! The class was so fulfilling, that we, the students’, organized and a made a very special present to Prof. Brown. A person, who has taken the course, can appreciate the beauty of the present! I highly recommend Prof. Brown’s class on Coursera. Your experience prior to taking this course: I had just general knowledge of our solar system before enrolling the course. Instructor: Prof. Brown is one of the best teacher whom you can stumble upon! He presents the material in a way so involving that you can’t stop listening to him. He knows the subject profoundly and has a sense of humor that makes the lectures a pleasure to listen to. Course Provider: Coursera provides an excellent platform for an awesome learning experience. The lessons are jam-packed with an enormous amount of useful information, guest lecturers like Kevin Hand (talking about exploring distant worlds like Europa) and Gohn Grotzinger (talking about Curiosity), that for a person that is not even interested so much in the topic, it will be an awesome and enjoyable experience to listen to the lectures. I have the habit to write in a notebook while studying and for this class I wrote 80 A4 lists (2-sided) with a treasure information that I will review again and again. Additionally, the exams are not a joke! They are difficult, one has to learn everything and you has to know the subject and the details in order to get a good grade. I got 100% thanks to my endless hours of studying. Moreover, the class is packed with so much additional information about space and the solar system, that I have not even began to study it! I highly recommend this course to everyone who is interested in a Caltech class of quality information and a world known professor like Mike Brown – the person who declassified Pluto as a planet. If you would like to ask me a question about the class, or if you are curious to learn what we, the class’s students, gave to Prof. Brown as a “thank you” for the course – Say Hi here!